It is often lamented by casual movie fans that “Hollywood has run out of ideas.” In fact, the seeming lack of originality in the mainstream movie pool has more to do with a fear of taking chances on those new ideas, which certainly do exist. Why gamble when you can pretty much guarantee a huge opening weekend with a sequel to, or adaptation of, an already beloved existing property? 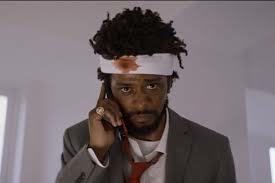 With that in mind, it’s rather amazing that this debut feature from writer-director Boots Riley, a founding member of legendary Hip-Hop group The Coup, ever got greenlit. I mean this in both a good way – because Sorry to Bother You is full of original ideas, sharp satire, and great performances – and in a somewhat more negative way, because it often feels so overstuffed with interesting concepts that it can’t possibly come together as a wholly satisfying, coherent narrative. Let’s start with the good, because there really is an awful lot of it. From the beginning, it’s easy to feel like we’re in good hands, with a cast that includes two of the brightest young stars to come along in the past decade, Lakeith Stanfield and Tessa Thompson, as well as supporting roles played by the likes of Danny Glover, Terry Crews, Steven Yeun, and Armie Hammer, as well as voice-over performances by two of the best stand-up comics alive, David Cross and Patton Oswalt. Not all of these characters are fully developed or vital to the overarching plot, but they are all very well-played. Riley’s visual sense as a director is also genuinely inspired, as established early on by a conceit in which Stanfield’s telemarketer character, Cassius Green, is able to physically occupy the living spaces of the potential consumers he cold-calls, most hilariously in inopportune situations like mid-coitus and during a bathroom visit (who answers the phone at these times? ), and, when it comes to certain individual scenes at least, the writing proves equally inspired, such as the aforementioned concept, or the “White Voice” idea given away for free in the film’s trailer. 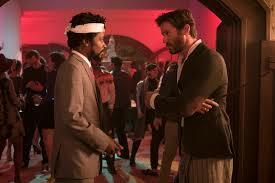 Perhaps the movie’s most inspired bit of social satire is a scene at a large house party thrown by billionaire Steve Lift (Hammer), who is so convinced that Cassius must be able to rap that he practically forces him to give it a try, with shockingly funny results. As inventive and entertaining as all of this is (to say nothing of a certain revelation that comes quite a bit later than it probably should; suffice to say it involves an unrecognizable Forest Whitaker), Sorry to Bother You has a disjointed, almost unfinished feel to it. Subplots especially suffers, as Cassius’s girlfriend, Detroit (Thompson), and her performance art – as well as a brief affair with their mutual friend, Squeeze (Yeun) – ultimately amount to not much. This movie’s problem is certainly not a shortage of ideas. Instead, it feels like Riley went all-in, throwing every inspiration he’s ever had into his first movie, when a tighter focus might have been more beneficial, especially since a lot of the most interesting stuff comes so late in the film, just before its somewhat abrupt ending. Still, a lot of what Riley throws at the wall does stick, and it’s truly amazing he was able to get such a weird, unwieldy, singular vision off the ground. The movie is a mess, but a fascinating one, and that’s the kind of thing I’ll take any day of the week over the safety of roughly half the Oscar crop in any given year.